Distributor: VHS and R1 DVD from Central Park Media / US Manga Corps out of print. Notes: Based on the detective manga "Hello, Harinezumi" (Hello Hedgehog) by Kenji Hirogane. This manga was also adapted into a more successful live-action version. WARNING: this review has more spoilers than Tokyo Drift. A woman comes across a wanted poster while stopped at a train crossing and finds, to her shock, that one of the wanted men bears a striking resemblance to her husband, who has been missing for three years. She hires a private investigator to find whether the man is the same person, so she can speak to him before his arrest. The P.I. realizes the man's true motives for having left the wife, which sets off a climactic scene at an amusement park, where the man tries to atone for his sins ... by killing his son. Dear Lord, oh why do they make anime like this? Apparently, they wanted to go for realism in the plot and background of this movie. Aim and target, however, are two different things entirely ... and it's bad enough when you *miss* the target. Problem #1: Half the characters in this story don't have any reason to be in this story at all. You could take the three main characters alone, and make just as substantial a plot with them as with the fifty or so we are forced to meet. Key example: the childhood friend of "psycho dad", whose face seems to get fatter with each frame. Problem #3: Why is it called Domain of Murder on the box and titled Hello, Hedgehog in the videotape? Our initial guess was that DoM was a title coined to pique interest in unsuspecting viewers (and reviewers) in this movie. But why Hello, Hedgehog? Where's Sonic and Ruby when you need them? Problem #4: Cue the badly animated rockslide. Where did THAT come from? (If there's a fence, why isn't it working?) Speaking of which, you'll never see tires dismantling themselves upon contact with a pebble quite like in this anime. More importantly, how in the world do three people (two of them children below seven) magically extricate themselves from a car flying off a gorge AND manage to hang on to a shrub (much less each other) in the middle of a rainstorm? And where do they get the logic that a six-year-old weighs more than an adult, and therefore, must be the deadweight? Puh-lease! There are so many problems with this flick, we can't keep count. Other examples include the three-frames-per-minute animation style, which makes South Park look state-of-the-art, not to mention an irrelevant cut-scene every minute or so (ooh, a boat! ooh, a phone! ooh, never seen a window animated before...); the wannabe lounge-lizard jazz (we've heard better Muzak in university elevators), a yakuza who *flaunts* a loaded weapon in a bar (keep in mind that Japan is one of the stricter societies in the world of law enforcement) and dares a guy to shoot him ... which, by the way, has nothing to do with the main plot, which has more holes than a crate of whiffleballs. Halfway through the film, we were chanting, "The movie's almost over, we MUST be brave." It was that bad. Not to mention that despite the fact that the father has left his wife and isn't exactly as good looking as Gendou from Eva (which is already bad), he manages to have a least *two* affairs. (Also nothing to do with the plot, by the way.) And the sniper who carries a shotgun (!) in one frame, only to have it conveniently turn into a sniper rifle in the next (which he conveniently hands to a main character to fire, of course). Turns out, of course, that the kid's just perfectly with everything. Naturally. Looking deeper for a moment, there are a couple of shreds to remind us that this anime is based on what we assume is far superior source material (the voice actors really do try to sell the show and do well given the level of the material they're given), but the horrible production and the sloppy screenwriting led to the inevitable train-wreck finale and beg us to ask why this was animated in the first place, and why anyone would bother even renting this. If you want real action suspense (or any suspense of any kind), try anything else. This almost makes MD Geist look good. Almost. 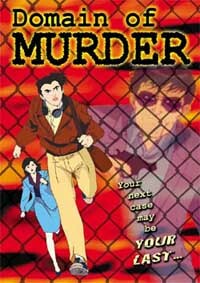 There's a reason we'd never heard of Domain of Murder before now, and we should've known there was something wrong when we saw it in the dumpster behind Blockbuster Video.